Win a $100 gift code to Accent the Party, a totally awesome online party supply store!! Their site is full of super cute supplies for any event or party you would ever want to throw. Prices are reasonable, so you could really get a lot with $100. You Heard right.. $100 to use on a Bridal party? a Baby Shower? Irresistible Favors ? Anything your pretty little heart desires!! 2. + 1 -Visit Accent the Party and comment back here telling me what you’d use the gift code for. Winner be chosen by Random.org. Giveaway will end Nov 4 2011. Open to US residents only. Must be 18 yrs or older to enter. Cant wait to see which one of you Lovelies will Win! I’d love to be entered in this giveaway!!! I love the personalized holiday candy jars! The snowman nose mints are cute too! I’d love to be entered in the Party give-away!! Thank you. oh what wonderful things in the “Accent the Party” site! :D wow!!! I would LOVE to enter the givaway! Thanks for the verses too! I would love to win!!! This would be great! I would get Christmas stuff! Like those reindeer cupcake wrappers! What a wonderful giveaway. I am a follower please enter my name. I love the snowflake boxes and the Christmas and Halloween cupcake wrappers they are all wonderful. I will also follow on facebook and twitter. Enter me! I want to win!!! I visited Accent the party, and I am throwing a bridal shower for my sister. I would for sure use the Ivory Ribbon Weave Favor Boxes. Her colors are Ivory, Chocolate, and Coral!! I followed on FB!!! YAy!!! I would use it on the candy bar wrappers and the muslin bags! So cute! The Diamond E likes ATP on FB! Oh gosh, the murano glass bottle openers are awesome, but there are tons of great things I could use! What a nice giveaway to start the week off! 1. Yes… please and thank you. 2. I would use it on Christmas favors – miniatures, candy jars, snowflake bookmarks, apothecary jars… all of it! 3. I like them on FB. 4. I follow them on Twitter. yes, I would love to enter!! i’d luv to be entered into this giveaway! i “liked” accent the party on fb and left a comment about you sending me. I would say there would be three things I would have a hard time choosing between. The personalized lip balm – my son got some for mountain dew flavored chap stick from my parents in his stocking this past Christmas and he is totally into chapstick now, lol! The flower box for gifts – they are so beautiful it can be a gift in and of itself! Of course now I have spent way more than the $100 but they have really great prices so it wouldn’t be too bad! I’d love to be entered in this generous giveaway. I’d be a crazy, happy lady to win! I love the filagree cupcake wrappers—all the colors. The free printables on the site are awesome too. I love perusing your blog every time I pop by. That verse you have on at the end of your post just about made me weep today. Thank you for sharing some of your heart. I would love to win so I would love to be included in this. I love the personalized gift favors especially the coffee packets as favors. I would choose FC6734st should I win! I jumped over to their site and found some hand fans that I was thinking about for our 2nd anniversary of our churn here in Jamaica. I was wondering where to get something like that. If I won I would use it for that. Thanks for hosting this fun giveaway. Ah….Yes! I would love to enter this giveaway! on that website. I would get some of them for sure! I am following Accent the Party on facebook. I’d use the gift card to buy the Lovebirds salt and pepper shakers favors! fabulous give away!!!! : ) would love to be enterered!!!! i think i would use winning on all kinds of thing but those little salt and pepper birds are just so adorable i would have to get them for everyone! : ) LOL!!!! hugs! Since I am called the party queen at church,winning this would be a boost to my party supplies! I want to be entered!!! I’d get the black and white damask gift bags to fill with goodies for my husbands 30th birthday party. Please enter me in this giveaway. Everything is so lovely. I would love the Personalized Holiday Muffin Mix Party Favors and the Winter Holiday Personalized Hot Cocoa Favors. I would like to be entered please! Thanks! I would use it for My daughters party! Those cupcake favors are adorable! Thanks! 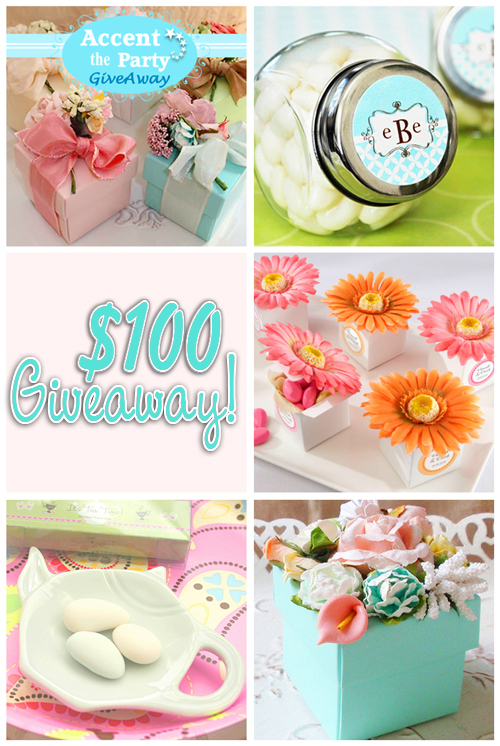 I want to be entered into this giveaway :) I love the shop! What great products! I would purchase the cupcake candles. that you could get and not just wish for. Yes, please enter my name in the drawing. Can I play too? It looks lovely! I would get apple cider muslin bags. I follow them on facebook!! I loooove your giveaways! Thank you for being so generous! Oh! I am definitely entering this giveaway!! This would be wonderful!! My neice is getting married soon and I am hosting a Bridal Shower for her and this would be SUCH a great blessing!!! I’d love to be entered !!! My birthday and my daughter’s bday are coming up!!!!! Hope I win!!!!! Thanks for another great giveaway!!!! Cheered to be entered into your awesome giveaway! I want to be entered in this giveaway. I would get things like the “Fall Flower Bouquet Favor Box with Choice of Treats”, “Snowflake Candle Party Favors,” “Personalized Holiday Hershey Kisses”, “Victorian Christmas Favor Boxes with Silver Frame”, and “Burgundy Square Favor Candy Box (Set of 10)”. p.s. It’s the last day to enter the giveaway on my blog! Be sure to enter when you get the chance. I would get some cupcake toppers! So cute. I would LOVE to be entered into your giveaway. Thanks a bundle. I would use this prize towards my daughter’s baby shower. She will have owls in the nursery and I saw some great owl themed items at Accent the Party. I’d love to be entered, count me in! I adore your site, can I enter the contest, please? I will highly recommend you to family and friends~beautiful items. I’d love to win this wonderful giveaway. Thanks for offering. wow! what an amazing giveaway, please enter me!!!! what a fabulous shop…..feeling giddy with excitement! I LOVE your blog. Such inspiration. Keep it coming, I say!! What?!?! How did I miss this great giveaway. So glad you post a reminder so I could enter. Thanks! wow, some very cool things for the holidays and upcoming parties!! I wanna enter in this giveaway!!! I would love to win the “give-away”. I’d love to be entered for this wonderful giveaway! Laser cut cupcake wrappers, Design your own Labels, Flower Top Favor Boxes, Candy Jar Favors, Hot Cocoa Favors, Cupcake Notepads, Lemonade Cone Favors…I can’t choose just one item! I just visited Accent the Party and I’d use my gift certificate on some wonderful favors for our church ladies group! I’m now following on Facebook. OOOO – enter me please! Wow! So glad to know about Accent the Party website! Love love love the cupcake liners and her gift boxes. Who would care what is inside with a gift wrapped like that? My mother-in-law would love it! She loves the details. I “like” ATP on FB! I would love to be entered in the drawing! I love your site…especially on Wednesdays when everyone posts something they made. I find all kinds of interesting things! Wow! I just went to Accent the Party and I want a little of everything! I especially want the tin mint containers, the Christmas lip balms, and the lottery ticket holders. I love your wonderful vintage pics and styling. I want to make the little boo boo case as small gifts for Christmas. This is my first Christmas in the States and I’d love to celebrate it by throwing a party and getting lots of Accent the Party’s goodies such as reindeer cupcake wrappers and personalized snowflake flavor boxes. I’ve just liked Accent the Party on FB. I want to be entered in the contest, too! I think I would use the winnings for either fun prizes for my large family at Christmas or for Christmas boxes donated to families in need. Please enter me in this giveaway! Thank you! I want everything! I think the cupcake wrappers are the cutest! I love your site too! Hi I want to enter in this giveaway.Thank you. Please enter me in this great giveaway, thank you so much! for a first birthday celebration, thank you! If I won, I would get some of those adorable cupcake wrapper! I am in love. Thanks! Yes, please enter me in the giveaway..thanks! I would love to be entered in the giveaway!! !